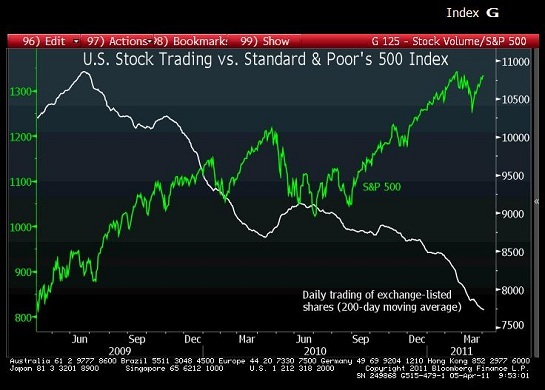 Declining volume suggests the stock market has falling participation and is thus increasingly vulnerable. The stock market adage "Volume is the weapon of the Bull" means that Bull markets are powered by strong demand for stocks, which translates into sustained buying volume. Courtesy of The Big Picture, here is a chart displaying volume and price of the S&P 500 over the past two years. Volume peaked in July 2009, a few months off the March 2009 bottom, and has slipped since except for a modest blip up last summer--a period of decline, which suggests the volume was selling, not buying. 2. a new kind of Bull market which rises magically despite declining participation by investors. Magic is of course not unknown in economics or finance; stripped of academic mumbo-jumbo, economic growth arises, we are told, from the emergence of "animal spirits." Financial speculation, we are told, is akin to dancing to the music (sounds fun! ), with the only advice being to keep dancing until the music stops. This chart is saying the Bull Market is bogus. Many excellent technicians see no real evidence of weakness, and those analysts with a fundamental perspective see the Federal Reserve's $6-$8 billion in near-daily injections of POMO cash and rising corporate profits as reasons for the market to loft ever higher. The value of U.S. stock markets is around $14 trillion, roughly the same as the national GDP of around $14.5 trillion (if official stats are to be believed). Can $6 billion in daily cash buying really sustain a $14 trillion market? That is asking a lot of an essentially trivial sum of money. As for corporate profits--it's not just the profits that count, of course, it's the multiple people are willing to pay to own that income stream. Depending on which profit numbers you're using (trailing, i.e. reported, or estimated, i.e. projections), then the current market is at a multiple somewhere between 12 and 16, which is near its historical average. At market bottoms, this multiple falls to around 6 or 7. So profits could remain at their current high level and the stock market could lose half its value, and it would remain within the boundaries of historical valuations. Thanks to unprecedented government/Fed intervention, the SPX has shot up in the past two years. Maybe it will climb all the way back to the 1500 level to trace out a multi-year triple-top pattern, or maybe not. Without any buying volume, then what exactly is going to keep driving it higher other than legerdemaine? Thank you, T.D.B. ($5/mo), for your splendidly generous subscription to this site-- I am greatly honored by your support and readership. Thank you, Jonathan F. ($60), for your stupendously generous contribution to this site via mail-- I am greatly honored by your support and readership.